Saint Peter's Fiesta in Gloucester, MA has been an annual tradition since 1931. This year, Latitude 43 wanted to help the town celebrate in a big way, by setting up a huge tent and hosting bands for the four nights of the Festival. You can read about the Fiesta by clicking here. To see what Latitude 43 is offering up currently click here. We were contacted by Latitude 43 inquiring if we could handle the sound for the tent they were having set up for the fiesta. If you looked at Latitude 43's website, you would know they regularly host bands in their bar that has a small stage area. So while the management at Latitude 43 is used to working with bands, they arn't used to needing sound reinforcement. 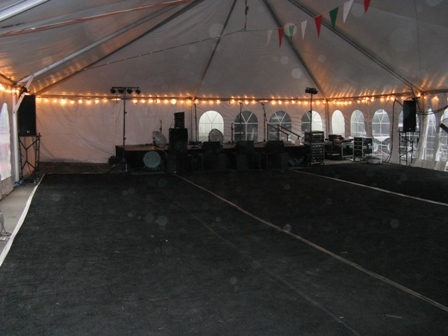 We sat down with the planners, learned the size and placement of the tent, that it was going to have a raised stage, and helped them plan out how much electrical power they were going to need to have temporarily installed for the event. We then designed a sound and lighting system and gave them a quote, which they accepted. Thursday We rolled in with our trailer full of gear and a full crew and transformed the naked tent into a house of rock for the show when the band Local 28 played! Friday We left speakers on sticks set up so there could be music played during the day. Then we returned and reset the stage for band Generation Gap. Generation Gap rocking the house! Saturday Lattitude 43 presold all of the tickets for the evening performance of the band Mile 21! Sunday Two members of the band Elephant House closed out the weekend with an accoustic set.